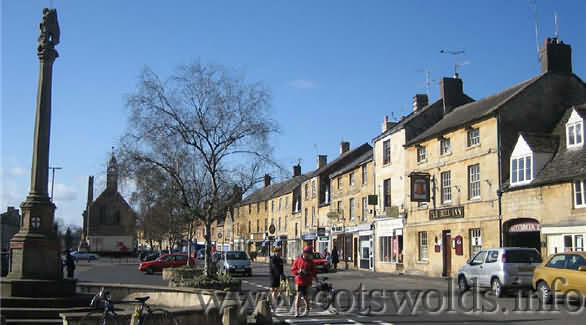 Moreton-in-Marsh is a thriving Market Town with a broad high street and offers the tourist a wide selection of accommodation and lodgings to choose from. Some of the more notable are listed below. The four-star Manor House Hotel is a friendly and welcoming home from home, where the original 16th century Cotswold manor blends seamlessly into the modern fine dining restaurant and conferencing facilities. Relax in the comfortable library and lounge with their open log fires; join the locals in the bar to sample some of the local ales or ask our mixologist to conjure a cocktail before enjoying a delicious dinner. Each of our rooms has a character of its own, with distinctive décor and every one has a fine view. Each is comfortably furnished with a Teddy bear to welcome you and a rubber duck in the beautifully appointed bathroom. While visiting us, you have the choice of dining in the 2 AA Rosette Mulberry Restaurant, the Beagle Bar or the Brasserie. The Manor House is the ideal spot for a weekend away, a holiday in the heart of England, a wedding, a celebration, a trip to the races or a place to discuss business. 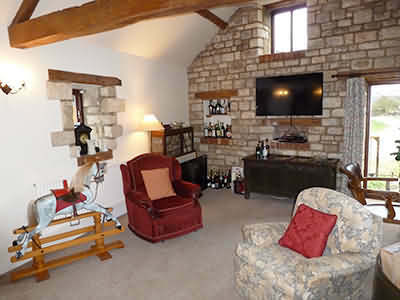 Steeped in history and dating back to around 1650, constructed of mellow Cotswold stone with a heavily oak beamed interior, the Hotel has been totally refurbished over recent years and has the benefit of 11 new boutique rooms completed in the Spring of 2012. Family rooms are available and a complete array of differently styled rooms to suit all our guests. The Hotel allows dogs in the bar area and has free Wi-Fi though out.. The White Hart Royal Hotel and Eatery is an AA rated 3 star hotel, with individually designed bedrooms including several feature rooms. It is an historic former 17th-century coaching inn located in the centre of Moreton-in-Marsh. Some rooms offer 4-poster beds, private gardens, very spacious wet rooms and roll-top baths. 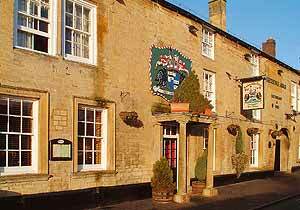 Our hotel is conveniently located in the market town of Moreton-in-Marsh at the head of the beautiful Evenlode Valley in the Cotswolds. 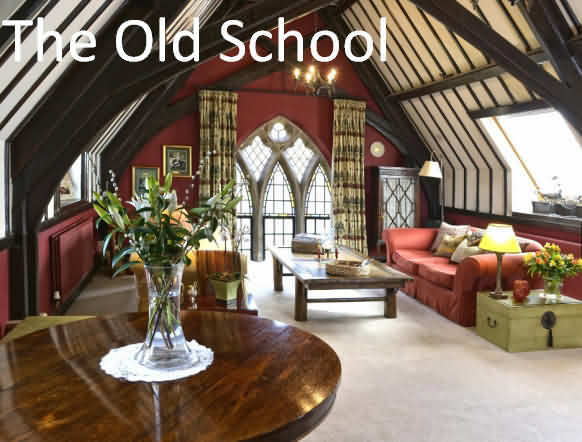 This iconic building is a former 16th century coaching inn and is as comfortable and elegant today as it was in its coaching heyday. It was so well loved historically that it’s where King Charles I chose to visit back in 1645, the day before the famous battle of Naseby. 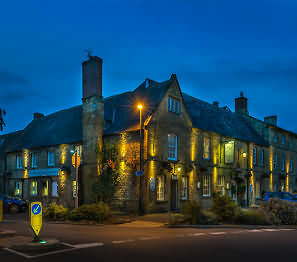 Whether you are looking for a welcoming place to spend the night or would simply like to enjoy a drink or a bite to eat surrounded by friendly faces, The White Hart Royal is perfectly placed, right in the centre of the historic market town of Moreton-in-Marsh. It offers all-day dining and an in-house coffee shop, free WiFi and is pet-friendly. The principal part of the hotel was built of limestone under a pegged oak roof in the early 17th century. It was substantially extended in 1773 and 1782 and has recently reopened following a major restoration and refurbishment programme utilising the original building – no modern extensions on this grade II listed property. Its collection of period artefacts and paintings reflect the four centuries of the hotel’s evolution while guests now have use of facilities equipped to 21st century standards. We are proud that the hotel has recently been placed at the upper end of the AA’s three star rating system. This included a four star equivalent rating for its cuisine. Disabled/Wheelchair Access - We have a several rooms with ground floor access and a double room which has been modified for wheelchair access and disabled facilities. Welcome to The Chapel House Bed & Breakfast, ideally situated in the heart of the Cotswold's and close to the towns of Oxford and Stratford upon Avon - only 8 minutes from Moreton-in-Marsh. Chapel House is two cottages knocked into one, so the guest bedrooms are totally private with their own staircase and bathroom. There is one double bedroom and one twin room. In both of the bedrooms you will find fluffy white toweling dressing gowns, 100% white cotton bed linen and towels, hairdryer, a radio bedside clock plus tea and coffee making facilities, mineral water and masses of books. Both our bedrooms are non-smoking. Guests are invited to arrive from 4.30 pm and depart by 11am. We want you to relax during our stay with us, so continental breakfast apart from weekends is served from 9am to 10am and cooked breakfast can be provided by arrangement, at a very small charge . Secure parking is provided by our private drive, we welcome walkers and have drying facilities to ensure you can make the most of your stay. We will shortly be able to take bookings via paypal. Wonderful to meet you and Suki,thank you so much for making our visit to the Cotswolds so special ,been an absolute joy staying with you. We are dog friendly here and you can bring your dog with you for a small charge of £5 per night. However, we can only accept up to two small or medium sized dogs. 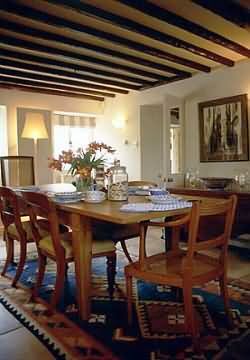 At weekends owing to demand we can only accept bookings for 2 nights or more. We also offer bargin breaks, just call to ask about them. 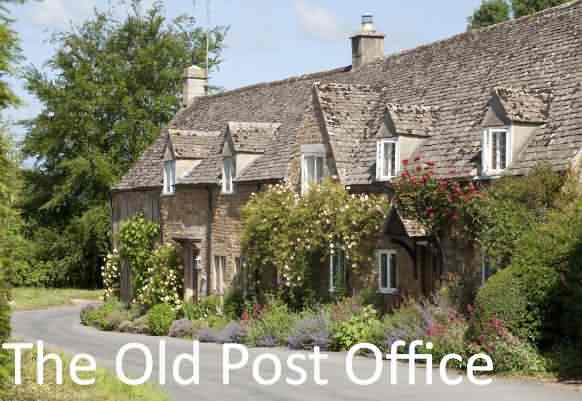 Featuring free WiFi, The Old Post Office at the village of Adlestrop offers B&B accommodation, just 21 miles from Oxford and 3.6 miles from the Cotswold town of Moreton-in-Marsh. Free private parking is available on site. The rooms include a flat-screen TV. You will find a coffee machine in the room. Extras include bathrobes, free toiletries and a hairdryer. Bike rental is available at this bed and breakfast and the area is popular for biking. Stratford-upon-Avon is 17 miles from The Old Post Office - Adlestrop, and Cheltenham is 18 miles from the property. The nearest airport is Birmingham Airport, 35 miles from the property. This property also has one of the top-rated locations in Adlestrop! Guests are happier about it compared to other properties in the area. 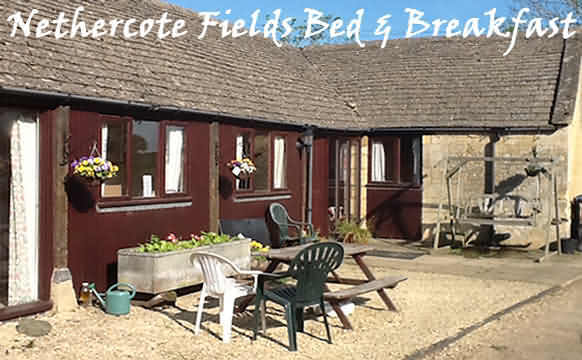 The Old School Bed and Breakfast in the Cotswolds at the village of Little Compton (near Moreton-in-Marsh) has topped the list in TripAdvisor's annual Travellers' Choice Awards , after scoring high in visitors' reviews and ratings from its top notch service to the cosy bedrooms. All of the rooms boast super-king size beds with Egyptian bed linen and duvets, a flat screen TV, and pampering touches such as fresh flowers in the rooms, snug bathrobes and luxury toiletries. In the heart of the picturesque Cotswolds, it's an ideal location for couples looking for a romantic retreat, or simply wanting to make the most of the great outdoors. 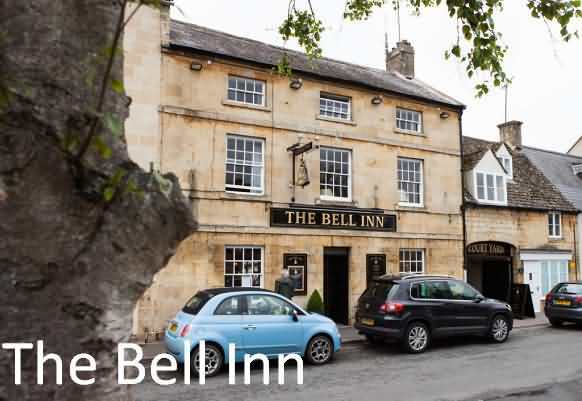 Situated in the picturesque Cotswolds market town of Moreton-in-Marsh, The Bell Inn has for years been a favourite for those seeking a truly unspoilt rural break combining a menu bursting with fresh, seasonal, locally sourced dishes. Considered by many to be JRR Tolkien’s inspiration for the ‘Prancing Pony’, Middle Earth’s most famous pub in ‘The Lord of the Rings’, The Bell Inn is a fine example of a traditional coaching inn providing quality food, drink and accommodation in welcoming surroundings. Each room includes a TV. You will find a kettle in the room. All rooms include a private bathroom. Stratford-upon-Avon is 14 miles from The Bell Inn, and Cheltenham is 17 miles away. The nearest airport is Birmingham Airport, 32 miles from the property. Located 2.1 miles from Moreton-in-Marsh. 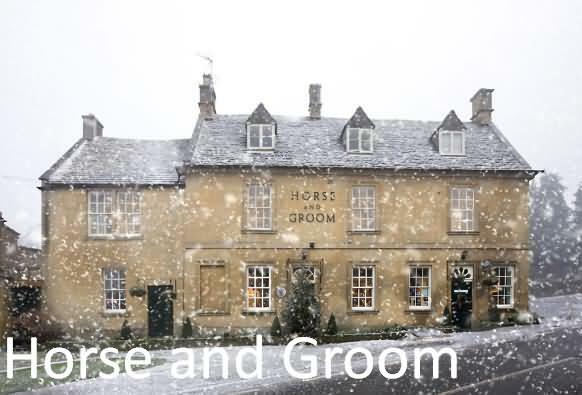 Featuring free WiFi throughout the property, Horse and Groom offers accommodations in Moreton in Marsh. Guests can enjoy the on-site restaurant. Free private parking is available on site. All rooms are equipped with a TV. You will find a kettle in the room. Extras include bathrobes and free toiletries. Oxford is 27 miles from Horse and Groom, and Stratford-upon-Avon is 14 miles away. Birmingham Airport is 32 miles from the property. No caravan and camping sites currently listed.